Chess is commonly believed to have originated in India during the Gupta empire, where its early form in the 6th century was known as chaturanga (Sanskrit: four divisions [of the military] – infantry, cavalry, elephants, and chariotry, represented by the pieces that would evolve into the modern pawn, knight, bishop, and rook, respectively). In Sassanid Persia around 600 the name chess became shatranj and the rules were developed further. Shatranj was taken up by the Muslim words after the Islamic conquest of Persia (633–644), with the pieces largely retaining their Persian names. In Spanish "shatranj" was rendered as ajedrez, in Portuguese as xadrez, and in Greek as zatrikion, but in the rest of Europe it was replaced by versions of the Persian shāh ("king"), which was familiar as an exclamation and became our words "check" and "chess". Murray theorized that this change happened from Muslim traders coming to European seaports with ornamental chess kings as curios before they brought the game of chess. Knights Templar playing chess, Libro de los juegos, 1283. The chess's game reached Western Europe and Russia by at least three routes, the earliest being in the 9th century. By the year 1000 it had spread throughout Europe.Introduced into the Iberian Peninsula by the Moors in the 10th century, it was described in a famous 13th-century manuscript covering shatranj, backgammon, and dice named the Libro de los juegos. Another theory contends that chess arose from the game xiangqi (Chinese Chess) or one of its predecessors. 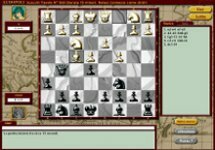 Play chess online and other games for free. Enter Ludopoli the games city and find new friends!